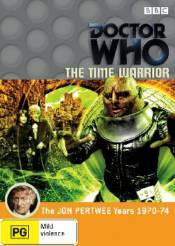 Time Warrior stars Jon Pertwee as the third Doctor alongside Elisabeth Sladen as Sarah Jane Smith in her very first story. A Sontaran officer named Linx is forced to crash land his spaceship near a robber baron in the Middle Ages. Requiring help to repair the spaceship, he ventures forward in time to the 20th century and kidnaps scientists. This attracts the attention of UNIT and the Doctor, who follows the trail back through time, unknowingly taking a young stowaway with him. Commentaries with actress Elisabeth Sladen, producer Barry Letts and script editor Terrance Dicks. Beginning the End - Cast and crew talk about the making of this story in this new featurette, partially shot on location at Peckforton Castle. Trails and Continuity, CGI Effects - Option to watch the story with 16 original video effects sequences replaced by CGI versions, Photo Gallery and 1974 Doctor Who Annual Radio Times Listings.